When you think of the word smoothie a few brands probably pop into your head – more often than not, its Innocent Smoothies. Believe it or not, but this ‘Innocent’ brand has been around for 14 years, and ever since its conception, the ethos behind Innocent is to do products in a truly good way – to make products that taste good, that do people good and to do good in the wider world too. With these values, it’s not hard to see why Innocent has become one of the UK’s most well-known and loved brands, bringing health and goodness to all its customers in a small bottle. 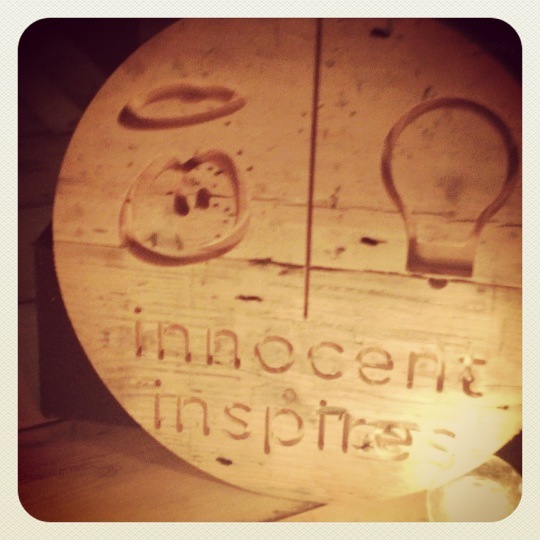 Now that Innocent is well and truly established, it has the ability to expand beyond its product range and really try to make an active difference in the wider world, and in 2013 this starts with a series of Innocent Inspires events. These events are a series of five evenings where all of Innocents key values are brought to life in one place. Yesterday, for the kick off event, it was brought to life in a church hall, cleverly transformed into a school gym with a difference. 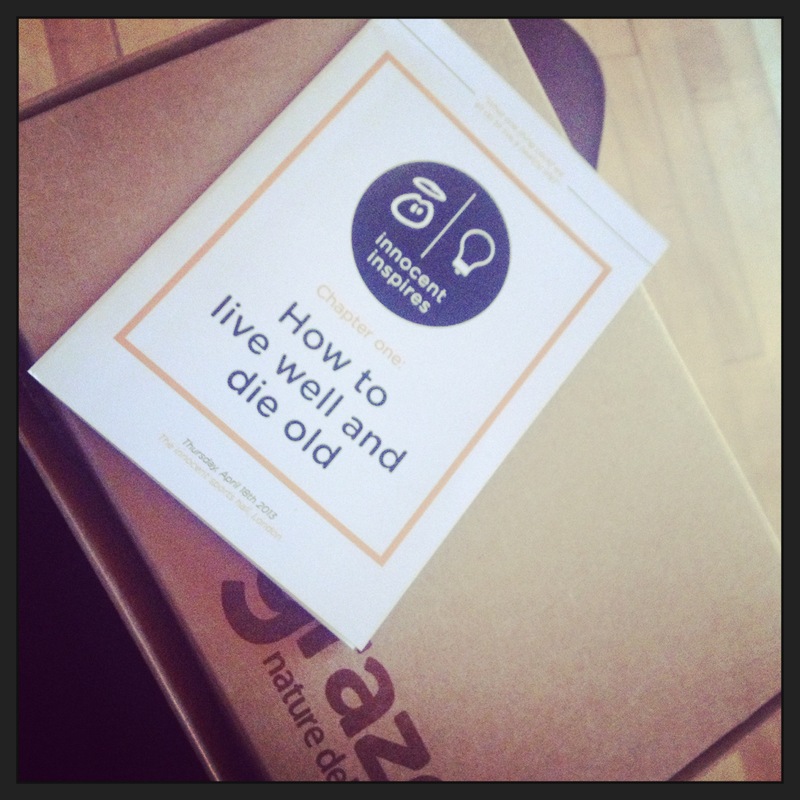 This was known as Chapter One: How to live well and die old. This event was all about health, how we can live healthier lives and eventually live longer. To say this event was inspiring is an understatement. Considering the rubbish weather we’ve been having lately, smiles are hard to come by, but the moment we arrived at Latimer Road station, we were greeted with big smiles by an Innocent representative donned in flourescent head-gear and that was just the start! As we reached the hall, the helpful staff (and you really do get the unusual feeling that everyone who works for Innocent loves their job!) 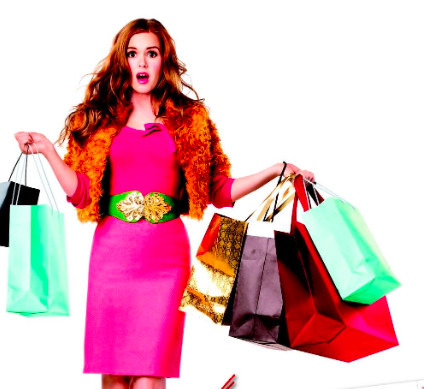 took our coats and showed us the way to a healthier lifestyle… it was upstairs. What innocent did was create an atmosphere that made exercise fun. Becky our reporter will tell you a thousand times how she hates exercise, so it’s no wonder she was the perfect choice to send along! 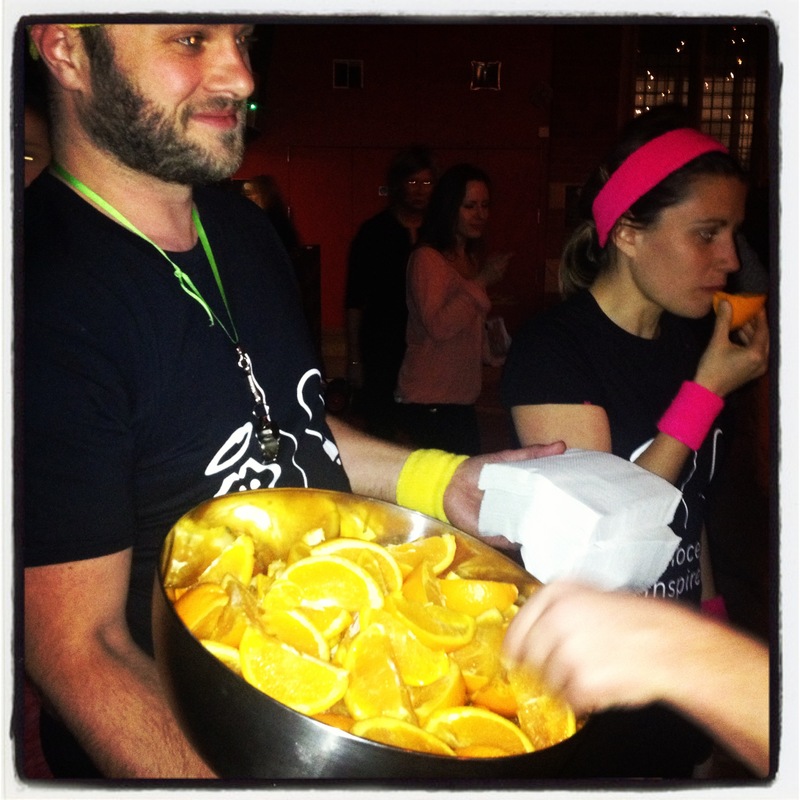 From delicious smoothies handed out as you entered the room to yummy plates of hummus and vegetables and teams of Innocent staff just waiting to get you involved in mini exercise events such as the ‘toilet squats.’ It really made the idea of eating and living healthier that little less daunting. Once everyone had gathered, it was time for the main event. Three inspirational speakers. Legendary Olympian and extreme adventurer James Cracknell, was the first to take to the stage, he talked about the power of human will, about overcoming the odds and how everyone can really achieve great things if they put their minds to it. In short form, this sounds quite patronising and like a cheesy American life coach trying to sell you the solution to a happier life, but with someone like James Cracknell (who was armed with videos and photos of all his outstanding achievements) you realise he was an ordinary person, who embraced his drive and focus to achieve great things. Taking the audience on a journey from the Olympics to the Antarctic, we all quickly realised that he really had done it all, and with that he was someone to aspire to be like, to learn from and to feel very lucky to be in the presence of. Next up was an equally inspiring person, but in a completely different way. Charlie Dark is the founder of Run Dem Crew, an ex DJ who took solace at night with his passion for running and a want for a healthier life. He turned this passion from something he did for himself, to something he involved his friends with and now something that inspires hundreds of people. Charlie’s aim is to get the younger generation off their backsides, doing something active and finding a community they can trust in which helps inspire, guide and encourage. What Charlie spoke about was team work, and how helping others is far greater than just helping yourself. Running, is the perfect example of this, a solo sport, where the majority strive to achieve personal bests. With Run Dem Crew, its not all about PB’s it’s about supporting each other and embracing the fact that you reached the finish line, not how quickly you did it in. Through this it seems very apparent that a lot of people in London are now enjoying the sport of running, but they’re also meeting new friends, feeling better about their lifestyles and encouraging others to do the same. Finally, we had Dr Pixie McKenna from Embarrassing Bodies and other health programmes. She took the audience through the top ten things that can really affect our health, and was the perfect end point to the other talks. Dr Pixie talked through in a very down to earth manner, how the smallest of changes could have a more positive impact on our lives. For instance, breakfast really is the most important meal of the day and without it you risk becoming obese in later life, fish is incredibly important in our diets – we need Omega 3 which our body doesn’t produce itself, and how 30 minutes of exercise a day can make you live a longer and healthier life. We caught up with Dr Pixie and also Charlie Dark as part of our v-log we created for the event. Why don’t you check it out below. 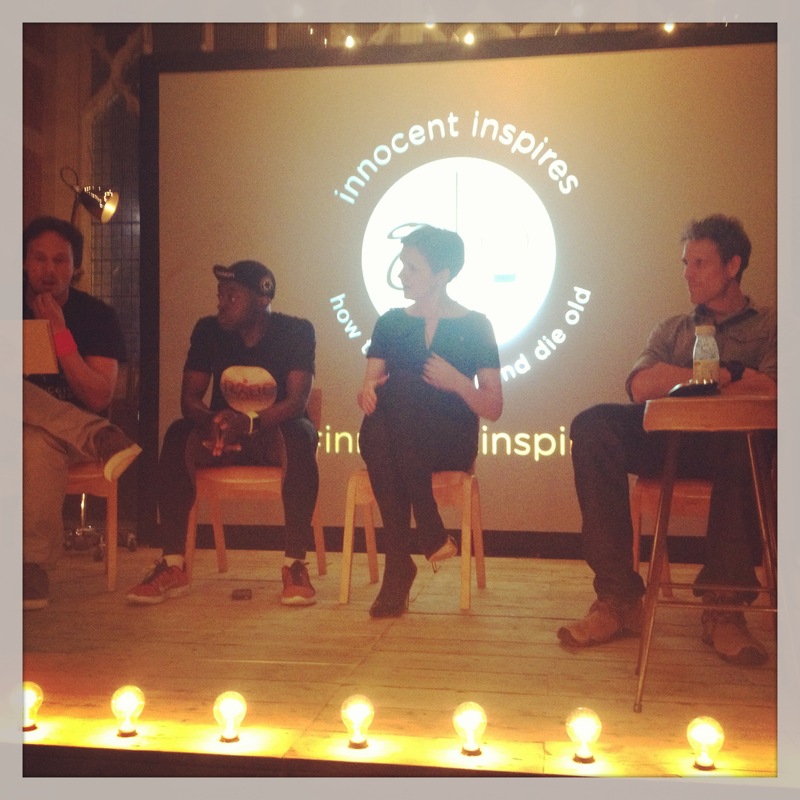 And if you want to find out more about the Innocent Inspires events (and we really recommend that you do) you can do so here. The next Innocent Inspires event will feature supermodel Erin O’Connor and will be all about Ethics, so make sure you book your place now!